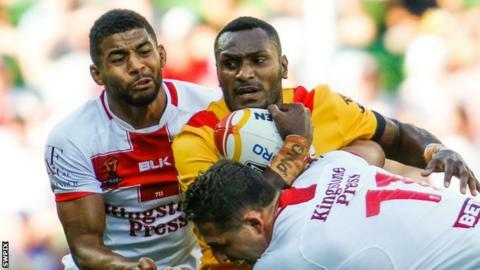 Widnes Vikings and Papua New Guinea centre Kato Ottio, who died aged 23, is believed to have suffered severe heat stroke after a training run. The Pacific International Hospital in Papua New Guinea, where he was treated, said he "collapsed during a training session, involving road running". Ottio signed for Widnes from NRL side Canberra in December. A post mortem is due to be carried out, with his funeral set to take place in Papua New Guinea on Friday. Ottio had been due to travel to the UK in preparation for the start of the Super League season in February. In a statement to BBC Radio Merseyside, the hospital said he was critically ill when he was admitted and his condition "appeared to be complications of a possible severe heat stroke". It added: "Unfortunately, despite all treatment measures, the patient's medical condition deteriorated and he finally succumbed during the early hours of 9 January." Ottio won six caps for Papua New Guinea, and scored one try in four appearances to help them reach the last eight at the 2017 Rugby League World Cup. He was on a training run with players from his former club, PNG Hunters, when he collapsed. Prop Wellington Albert, who was signed from Hunters, had been due to fly to England with Ottio on Thursday to take up his contract at Widnes but is now set to delay his departure. "We will make sure Wellington is in the right mind before he leaves here," Hunters coach Michael Marum told NRL.com. "Currently his mind is not right so we are trying to give him assistance. Not only Wellington but the other players as well." Widnes chief executive James Rule has said Ottio could have become "a real hero with supporters" and the Super League club has made a private donation to his family to support them. The Vikings have also invited fans to contribute towards an online crowdfunding page, which had raised nearly £5,000 by 09:00 GMT on Wednesday. A minute's silence will be held at the side's pre-season friendly against Whitehaven on Friday. "It's just shocking that this can happen to somebody at 23 years of age, who was an athlete and in the prime of his life," he told BBC Radio 5 live. "We were in communication with Kato last week. We went out and bought stuff for the flat he was going to be sharing with Wellington Albert. He was so excited, we'd sourced his shoe size and got him some boots. "It was so close but then we heard something had happened to him and before we knew it he'd passed away. We're still a little bit numb. "Papua New Guinea are on an upward spiral at the moment and there is a strong feeling that this is a generation who will make the next step to put the Kumuls on the map. "Kato was one of those players. He was coming over here, he was excited about what was to come and how his career could take off in Super League. It's so sad."